Ch-Ch-Ch-Chia! Unlike any other Mogwai, this one loves the sunlight and doesn't mind being watered after midnight. 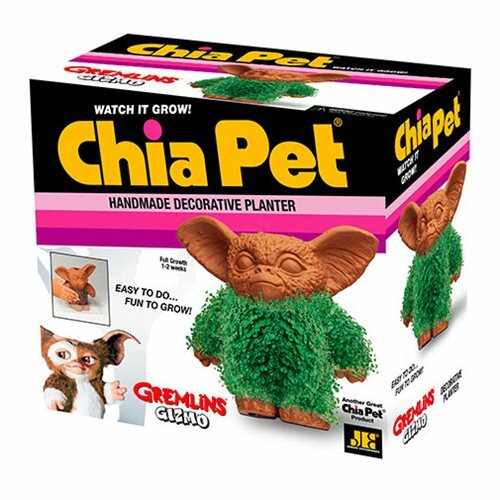 Bring back the joy of arts and crafts with this Gremlins Gizmo Chia Pet. You'll see a full coat in about 1-2 weeks, and you can reuse your chia indefinitely. Simply replant with chia seeds packets (extra seeds included) or similar herb seeds such as basil, alfalfa, marjoram or thyme. Package contains a chia handmade pottery planter, chia seed packet for 3 plantings, convenient plastic drip tray, and planting and care instructions Sheet.